Amazon is a very rich company, with a market cap of $361 billion and stock price of over $750 a share. But as we’ve seen, the fortune of huge tech companies don’t often translate down to its employees. In some cases, it leaves them living in squalor. Take the blight of Amazon’s warehouse workers, especially its non-permanent seasonal employees who work long hours during the holiday season. 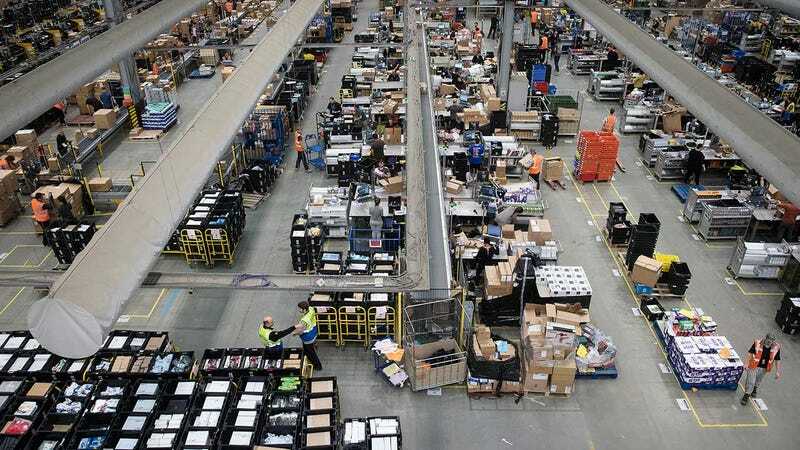 In Scotland, some Amazon warehouse workers have had to resort to sleeping in tents in order to save money and commuting time. The depressing report, which comes from The Courier, says that “at least three tents” were spotted in the woods near a fulfillment center in Fife, Scotland. One worker, who did not wish to be named, was reluctant to speak to The Courier but did describe the firm as a “poor employer” and criticized working practices at the Fife site. He added that he had opted to stay in a tent as it was easier and cheaper than commuting from his home in Perth, although his camping equipment had disappeared by Friday afternoon. In a statement to the newspaper, Amazon said that it “provides a safe and positive workplace” and that “the safety and wellbeing of our permanent and temporary associates is our number one priority.” But the idea that some employees are braving subzero temperatures to work at the Amazon warehouse clearly goes against that. Sadly, this isn’t the first time we’ve seen employees for tech companies result to ridiculous living conditions. A few years ago, a former intern squatted inside AOL’s campus because he couldn’t afford to live in Silicon Valley after his internship was over. For two months he hid in the shadows and took advantage of free wi-fi and food. Various Google employees have also admitted to living in trucks or RVs, sometimes even inside the Google parking lot. One San Francisco software engineer even keeps a blog of his living situation inside a truck. The high wages Google offers apparently aren’t enough to outstrip the cost of rent in the Bay Area for some employees. Quora threads offer tips to those that want to forego running water in hopes of paying off student loans and maybe eventually buying a house. Google, for its part, doesn’t necessarily allow this to happen, but it’s willing to turn a blind eye to employees who basically live at the office or sleep in the parking lot. But it’s not normal for workers to live in the backyard of their employer. It’s just not. It’s also not normal to live in glorified dorm rooms under the guise of “co-living.” Yet, that’s increasingly becoming a thing, and the prices for this type of housing are just rising higher and higher. But back to the Scots in the tents. What’s particularly egregious about this situation—what makes it worse than the engineers who would rather live in a converted truck than pay $2,500 a month for a bedroom in San Francisco—is the fact that that these employees are struggling to get by. Living in a tent because it costs too much to go home is not normal for industry. It’s just plain awful when employers are raking in record earnings on the backs of their workers.